Roy David's architecture firm, Roy David Studio, partnered with the architect Nimrod Meir Levi to transform a Bauhaus conservation building ground floor into a restaurant named Milgo&Milbar, a Mediterranean seafood bar & restaurant that serves as a significant urban hangout place on Rothschild Blv', Tel-Aviv, Israel's most touristic and vibrant boulevard. The architects worked to renovate a one and half storey space by knocking down walls, removing all previous ceiling & floor copings and replacing them on the one hand, with mineral plaster and pigmented concrete in warm shades of sand and oak brown, to create a cozy and welcoming atmosphere, and on the other hand cooler shades of grey & pearl white to create a smooth balance color scheme that connects with the building Bauhaus style of exterior. "One of the main design goal was to create unique sitting situations, some will help to connect the inner-space of the restaurant with the vibrant Rothschild Blv' atmosphere and some will allow to experience the open kitchen fast and colorful vibes. Another example of a unique sitting arrangement is a brushed silver metal bar that we placed on top of an existing handrail situated in a small balcony facing the boulevard," says Roy David. 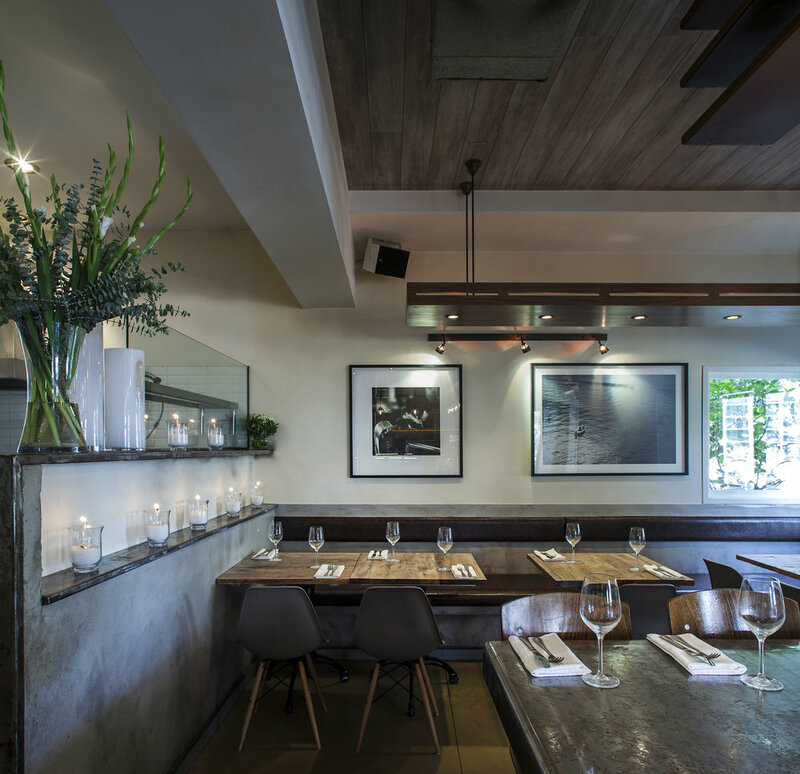 The restaurant is divided into five main spaces, the main staircase serves as an outdoor foyer which encourage casual mingling, a very common hangout experience in Tel-Aviv. The main space is divided into low bar sitting zone and a traditional tables sitting zone surrounded by an indoor concrete bench. 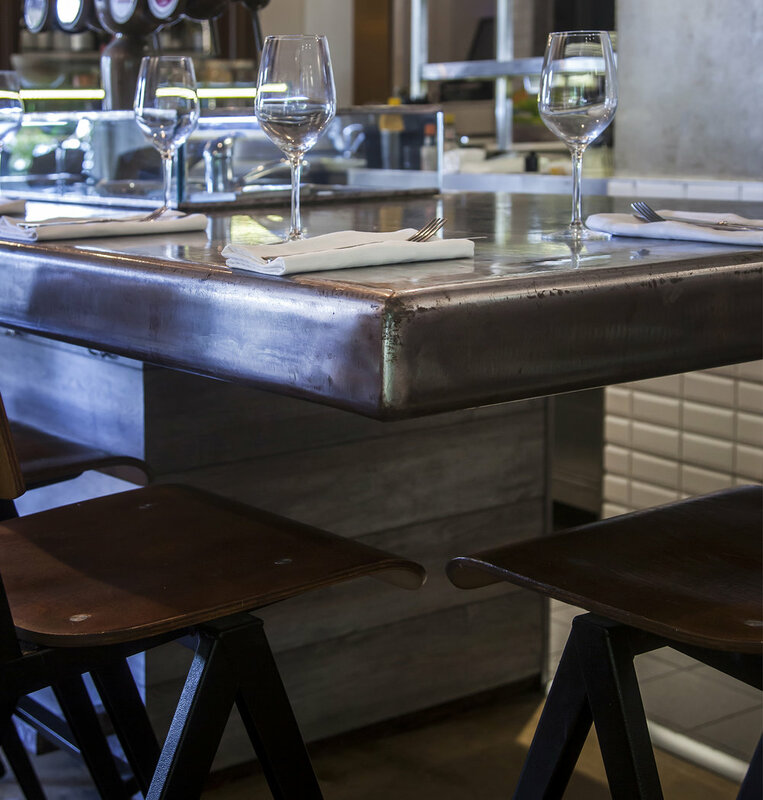 At one end of the L shaped bar the designers left a large metal plate cantilever which serves as a prime sitting zone. 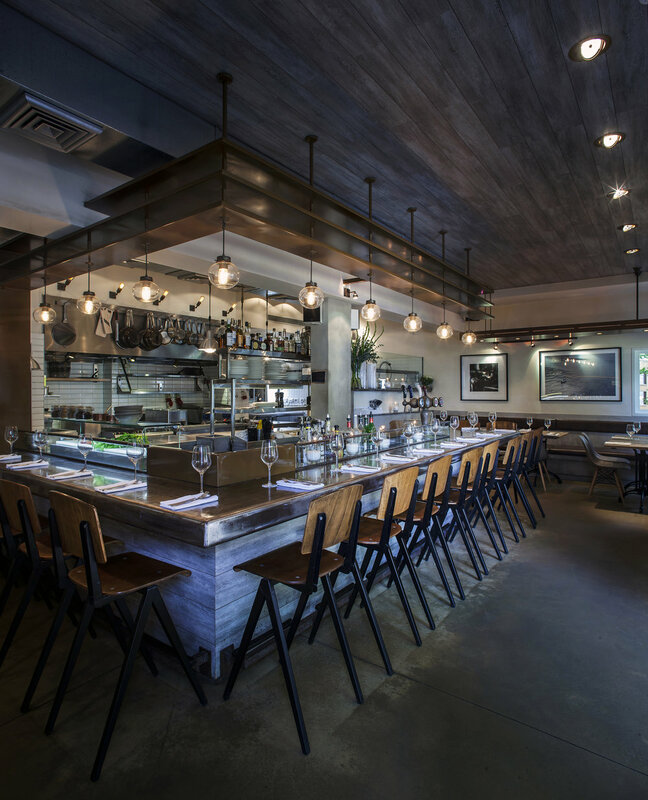 Sphere shaped and hanging pendant lights with iron fittings featured throughout, a multi-shelves metal structure which pendant over the bar. 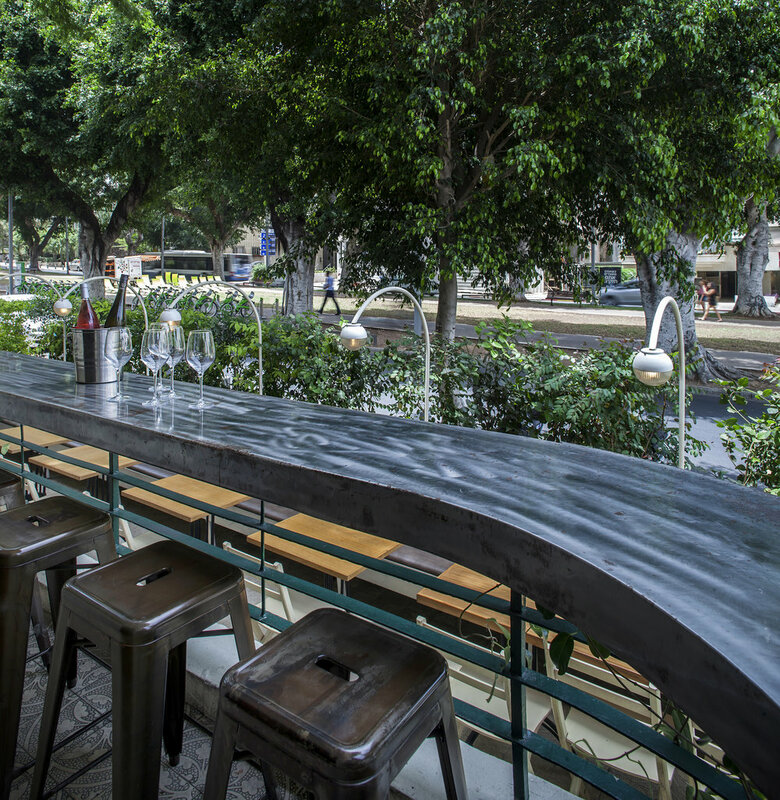 In front of the main bar there are the small balcony sitting area and the street level garden area both facing Habima – Israel national theater and square. Both were designed to enable interaction with the boulevard. Except from its obvious purpose, the plants and trees surrounding the restaurant were also used to balance the exposure to boulevards cars & cabs traffic. Each and every part of the restaurant was customized and carefully measured as a result of the aged building structure. "We had to take extra cautious steps so that the wooden ceiling coping and all the other elements which hang from the ceiling won't overload the ceiling aged structure" Roy explains. The restaurant serves a range of seafood in flavors inspired by French, Israel and Couture Mediterranean kitchens along with spritz, wine and French-style cocktails. "From an architectural point of view, the transformation of the space is remarkable – the rumors of the jinxed location on Rothschild 142 blv' and Marmorek st' for the last 15 years or so is proudly over and I think architecture and precise design had a lot if not all to do with it." says Roy.